Fast class for cruising on the open highways. Corvette is beyond any car I have ever driven - moth ride, great performance and handling - great gas mileage and it gets up and goes when you ask it to respond. T is a targa so I can remove top - have had it up to 145 mph and it handles like it was going 50 - plenty of trunk space for 2 sets of golf clubs, suitcases and a couple cases of beer. I have had the car for over four years. I have never had a significant problem, other than replacing tires and brakes, battery and wipers. It's been very reliable, and extremely fun! Older car Has a lot of mechanical problems I've kept it for nostalgia. The car is a 2 seater it does have it is a 50th anniversary so it is a collector's edition. Corvette review!!! 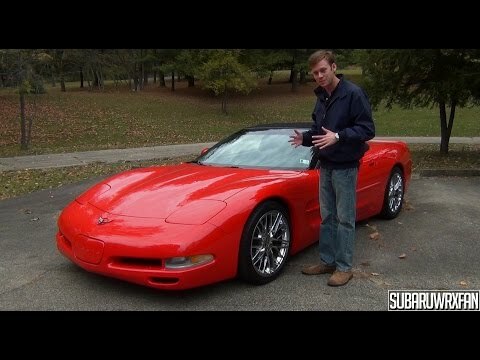 Why isn&#39;t the C5 corvette more appreciated!?! On certain passenger vehicles equipped with electronic column lock systems (ECL), when the ignition switch is turned to LOCK the ECL prevents turning of the steering system. When the vehicle is started, the ECL unlocks the steering system. The vehicle is designed so that if the column fails to unlock when the vehicle is started and the customer tries to drive, the fuel supply will be shut off so that the vehicle cannot move when the vehicle cannot be steered. If voltage at the powertrain control module is low or interrupted, however, the fuel shut off may not occur and the vehicle can be accelerated while the steering system is locked. If this occurs, a crash could occur without warning. On vehicles equipped with an Automatic Trnasmission, the dealer will disable the steering column lock by removing the column lock plate. When the ignition key is removed, the transmission shifter will lock but the steering column will not lock. On vehicles equipped with a manual transmission, the dealer will reprogram the powertrain control module. The steering column on these vehicles will continue to lock when the key is removed. Owner notification is expected to begin during the second quarter of 2004. Owners should contact Chevrolet at 1-800-630-2438. On certain passenger vehicles equipped with electronic column lock systems (ECL), when the ignition switch is turned to "lock," the ECL prevents turning of the steering wheel. When the vehicle is started, the ECL unlocks the steering column. The vehicle is designed so that if the column fails to unlock when the vehicle is started and the customer tries to drive away, the fuel supply will be shut off stopping the engine. This prevents the vehicle from being driven when it cannot be steered. However, if voltage at the Powertrain Control Module is low or interrupted, the fuel shut off may not occur and the vehicle can be driven while the steering column is locked. If this occurs, a crash could occur. On vehicles equipped with an automatic transmission, the dealer will disable the steering column lock by removing the column lock plate. When the ignition key is removed, the transmission shifter will lock, but the steering column will not lock. On vehicles equipped with a manual transmission, the dealer will reprogram the powertrain control module. The steering column on these vehicles will continue to lock when the key is removed. The manufacturer has reported that owner notification is expected to begin during the second quarter of 2004. Owners may contact Chevrolet at 1-800-630-2438.